After casting the all-important Not Ben Affleck in its new Daredevil series, Netflix has moved on to the next crucial piece of its Marvel puzzle—that of his corpulent crime lord nemesis, Kingpin. 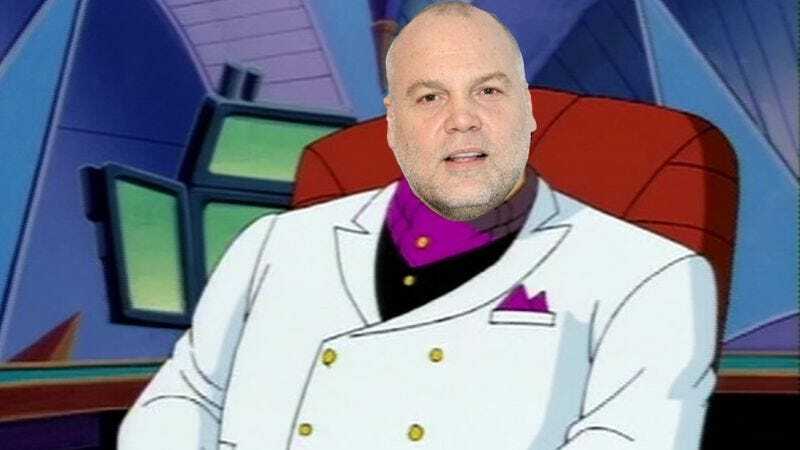 According to Marvel itself, Vincent D’Onofrio will play the mob boss, stepping into the massive shoes filled by the late Michael Clarke Duncan in the 2003 movie. Of course, when we first meet D’Onofrio’s character, he’s still just Wilson Fisk, a “powerful businessman” who’s smaller both in terms of criminal enterprise and in physical girth (relatively speaking). And the series—which recently replaced Drew Goddard with new showrunner Steven S. DeKnight—will find Charlie Cox’s blind lawyer Matt Murdock first clashing with Fisk over his “interests in the future of Hell’s Kitchen,” according to the synopsis. “Why doesn’t Hell’s Kitchen serve jelly donuts?” Fisk will demand. “Are you allowed to eat jelly donuts, Wilson Fisk?” Murdock will ask. And so their epic war begins.